31 Stories in 31 Days – ADHD in Your Own Words, includes the uplifting stories of 9 very public figures with ADHD. 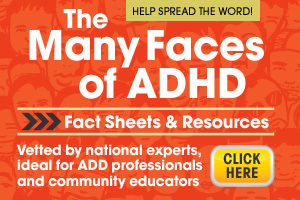 They are CHADD’s ADHD Champions: individuals with ADHD who have overcome their struggles and blossomed in their successful careers. Their stories are tales of triumph and inspiration. Each of our Champions serves as a testament to perseverance and the ability to rise above the disorder. Our Champions see ADHD not as a defect, but as a lifelong challenge in which the best is brought out in them each and every day. Read their stories here. Next Post Next post: Stories about living with ADHD from the people who live with it.